One of my passions is to buy ingredients for my cooking while traveling. Whereas meat, fish, and vegetable products may be imported to Norway, while traveling in Europe, traveling outside the EU is more complicated on what food products you may take home to your kitchen. What you may bring back with you, is spices, and I have a large collection of blends from many of my destinations. Here us what I look for when shopping spices in the US. My kitchen is packed with different spices I have bought in the US. Brands like Tone's, McCormick, and Goya produce a wide range for seasonings for different cuisines or ingredients. Here are a few ideas what brands to look for to take that American taste home with you. The Tone's brand has been for sale at Sam's Club, but last time I visited, many of my favourite blends had disappeared from their shelves. There are different blends custom made to different kind of foods. "A spicy, coarse blend of onion, garlic, spices, red and green bell peppers, with an added touch of crushed red pepper for heat. Used to make a delicious, spicy sauce for pasta. This colorful blend has medium sized pieces of peppers, onion and garlic." As most of Tone's seasonings contains salt, add seasoning to your food before adding more salt. My favourite Tone's blend is the Rosemary Garlic blend, a seasoning with a wide range of uses. It containes rosemary, garlic and onion, black pepper and lemon peel. I remember the first time I got a packet of Sazón Goya seasoning. It was left for me in a small gift box assembled by Erica, my cousin. 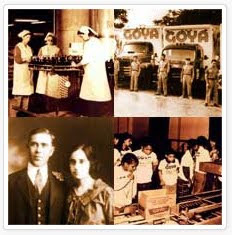 Goya Foods is the largest, Hispanic-owned food company in the United States. It was founded in 1936 by Don Prudencio and Carolina Unanue, two immigrants from Spain. They produce a wide range of products. The Sazón Goya is a range of dried spices. They come in different blends, e.g. with coriander and Annatto, Saffron, and tomato and coriander. All these contains sodium as well as the other ingredients, and both saffron and annatto contains food colouring as well. All have a distinct aroma. My favourite is the blend with saffron, and I used it to flavour and colour my paellas. Used to, as I discovered another blend of seasoning in Sitges last year, that had so much more of that genuine Spanish taste. I have a large number of McCormick products in my kitchen. This as this company produce seasonings in different forms, some of them quite clever. 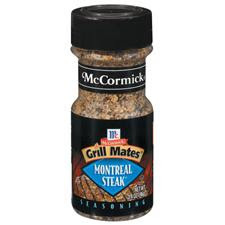 The Montreal Steak is one of my favourite McCormick blends. I cover the surface of the meat with it. It contains red as well as black pepper, garlic and paprika. Amother favourite is the Buffalo Wings seasoning. I love this specialty, but the genuine taste is hard to create from scratch. I bought three sachets of Buffalo wings seasoning, and it creates the real McCoy!! Another interesting range of McCormick spices is the Bag'n Season. Bag'n Season is a roasting bag, as well as a spice mix to prepare a special dish. You get Bag'n Season for meat loaf, beef stew, Swiss steak, Chicken, and many other dishes.